It’s been a while since I post anything here >_< I’ve been busy selling my own clothing (Ruru Victoria ) and attending local conventions. There are more updates coming, so please stay tuned! Ah, I finished 2 new Amigurumi few days ago and I’m kinda happy that I finished them using new technique! Hopefully I will continue to use it to help me make more kawaii plush. This is Meow-Chan! He’s a tiny kitty with his tongue sticking out. He’s always hungry and playful ^^ I used special yarns that I purchased from Japan. I think you can’t buy it anymore coz they sold out. =_=. Tricolor pastel yellow, green and white. You can make Meow-chan into a charm, or brooch. I’m planning to use two-way pin, so you can pin it anywhere or wear it on your head! Meow-Chan is tiny, about 4inches long, with tail is 5 inches. Overall, I’m happy that I’ve made! I hope you all like what you see. I’m thinking to make a tutorial on crafts, what would you like to see? Hope you all have a great Wednesday! Noticed that little brown bunny? it is not a bunny actually… it is a tanuki. A Japanese Raccoon appeaars in the anime randomly and I couldn’t ignore. He’s very cute! I found this picture online, someone drew this. I’m so happy that I can use this reference to make my tanuki ^_^ I took very LOOOOOOONG time to finish him because was the holiday and I was lazy -_-. BUT, I’m glad that I finished! 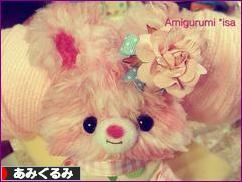 Someone on Ebay is selling the tanuki but I think it’s very ugly… hahah, don’t ask me why but I think it’s ugly -_-. Just a little secret, I’ll be cosplay this character ;P Do you know this character’s name? About the pattern, sorry, since this is the first time that I try this, so I didn’t write down how I made it. Maybe in the future I will make a pattern for sale? Not sure 🙂 I’m so noob with writing patterns. -_- The truth is, I’m more used to Japanese pattern than American. American’s are SO difficult to figure it out, since everything is writing and abbreviation. Japanese style is much easier and faster to understand, hence you spend less time trying to figure it out, just imho. I always wanted to make colorful amigurumi bear, like candies 🙂 I finally got a chance to make it! Aren’t they the cutest thing ever? 😛 They are between 4 ~ 5 inches tall, they all able to pose lightly such as standing and sitting. Candy bears are most friendly and gentle bears, they love each other and always want their friends to be happy! Well, I hope you all had a great Wednesday, I shall continue work more on other project and I’ll get back to ya. Oh, before I go, here is the finish Poro ^^ He will be listed in the shop tomorrow! I had an urge to do a very kawaii makeup recently. I NEVER learned how to do those kawaii doll-like makeup, even I saw a lot of girls are doing it. I was like “nah, this is not for me, I am NOT kawaii at all, so why bother?” But I changed my mind and wanted to give a try. I was wearing Geo Princess Mimi Apple Green (Bambi series) contacts. It is the most COMFORTABLE contacts besides Acuvue Oasis! I highly recommend anyone wants to wear green contacts and also want some enlargement of their eyes, this is a gorgeous contacts. The only thing is the color is not so vibrant (in my opinion) but it’s a great comfy lenses for daily wear. I bought it from Pinky Paradise. – Mixed Banila CC cream with 3Concept Eyes sunscreen for coverage. Okay, you might noticed something in the picture, something pink, something fluffy, hehehe. Yup it’s the famous Alpacasso! I have been selling Alpacasso for 2 years. I have a very reliable vendor in Japan who is direct dealer with Amuse. I make sure all my Alpacasso are 100% authentic. I always have the newest collection in my shop and once they are gone, they ARE GONE. I do not have and older collection. :S You can visit my shop here: RuRu Victoria. Amigurumi Usagi & Hitsuji Set to Travel! SO cute! I need this in my life! This is an improved version. I used to make their cloak with felt fabric but this time I want to explore and see if I can crochet a cloak for them and I did! 🙂 I think I’m satisfied with the result and I think they looked very adorable, don’t you think? These little cuties don’t have names, so sad. But I’m sure their new master will give them cute names! Little Usagi without the cloak and hat ^^ isn’t he the cutest? Little sheep! I really liked this version, I can’t stop kissing his cheeks xD So cute! We spent at least half day playing DDR and Parapara dance arcade! It was fun except that I was out of breath…not because of my out of shape body, it was lack of oxygen, aka blood. -_- yeah, I’m heavy anemic and I usually out of breath just walking up stairs. -_- I gotta do something about this.. otherwise I have to do iron transfusion (according to my doctor). This is my 2nd time trying to dye yarns and I learned a lot from these yarns! I will show later on my 3rd try, yarn even look better and softer! This puppy is No12, Golden Retriever. I can’t believe that I already made 12 dolls in 2014! This is great! I wish I can make as many as possible, I got SO much yarn thatI want to make them into something really cute and adorable! I want to make “pocket friends” that you can take it with you anywhere, just put them in your pocket! They are also well dressed and is ready for camera closeup! Possible with accessories…uhm, that will be a lot of work BUT it will be fun! Many I’ll have some limited collection? ^_^ that will be my future project in 2014! Anyway, this puppy is ALMOST ready! I still need to make ear clips and a pretty dress! ^^ Will post finish picture in here soon. If you have Instagram, please follow my account: Marlinx. If you don’t mind look at my face and cosplay pictures, hehehe. The odd thing is….I didn’t put 1 ingredient and look how it turned out? O___O Kinda pinkysh but not really pink. I’d say it’s between apricot & pink? O_O I’m amazed tho xD Maybe I’ll write it down all the ingredient, so next time I can have the same result. Look at them, they are completely in different color O___O… Don’t ask me why 🙁 I didn’t know what I add at the time. OKie, I hope you all have a great weekend and I appreciate all the support from you…verbal or prayers 🙂 Knowing someone actually like my creation is a priceless reward for me! Thank you!! It’s been a while since my last post! After came back from Megacon I was working on my next convention…which is Hurricon. I wanted to introduce many new collections/creation from my studio…I think I was trying too hard to accomplish everything BUT thank GOD! And with my Mom’s help I was able to finish what I wanted. This was the first plush that I created. I wanted to introduce these cute bunnies to my customers and also want to know their feedback and reaction about the bunny. At the end, I can say, BABY BUNS are the cutest thing ever!! Everyone who came to my table loved these little buns :3 I guess, Baby Buns will be a regular collection in my shop! Finally I’ve finished this bear! This was a custom order from LAST YEAR! OMG, I suppose to finish within a month or so but I delayed till now. I hope she’ll be happy when she sees this bear! I made many white bears before but I must say this is my favorite. Why? Because he’s wearing a jumpsuit. It’s a fist time for me to crochet jumpsuit for amigurumi, I did it fast and quick! I think I should be able to crochet more in the future, yay! Little fake leather bag for him to carry his favorite manga and yarn. Does the little bear crochet too? I don’t know but he surely loves yarn! Spent at least 40 mins+ to make this little bag. I bought this fabric long time ago. I was going to make hat and a vest but I think bag will do 🙂 I will try to make a shoes out of it. The fabric is kinda thick tho, so -_- I gotta change my needle for it. Forgot to show you the back of the bear…2 tiny green button 🙂 jumpsuit is removable but you might have to squeeze the bear -__- It’s better to leave it like that. hehe. I will make jumpsuit according to what I have at the moment. Also, accessories are going to be different, unless you want the same bag like this. I try to make different things in each custom order so everybody’s order will look different and unique. 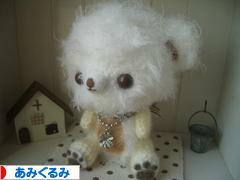 This bear is will be featured in U.S. & Japan… so which ever studio sells it first, the bear will go to the final owner. 😀 She’s about 5~6 inches tall ( When sitting) made with puffy deep pink yarn ( Very lovely color! I personally really like this type of pink). Here is the full shot! She’s about 6 inches tall when sitting, so it’s a little bit bigger than my usual amigurumi. This is her friend; Sheep! Sheep is resting on top of Pinky’s head because she feels safer, LOL. I enjoyed creating these 2 anime characters! I love Karneval a lot! During making usagi (bunny) & hitsuji (sheep) I was planning to crochet their outfit BUT something came up and I NEVER could make their hats straight… so blah -_- I gave up. -__- Instead of crochet their outfit, I used wool felt to make their cloaks and top hat. Since both cuties have very fancy hats, I used pearl beads and lace flowers to decorate their hats. For usagi’s cloak, I used mini buttons instead of felt to make cloak look better. Love it! Don’t you agree? He SO adorable and I like his facial expression…so serious, haha. Happy New year everyone! I haven’t update this blog for few months, because I was busy preparing my first ever convention, attending Animate!Miami anime convention. It’s a smaller convention compare to others. 2013 only had about 5000 attendees but report said this year they have about 10,000 attendees! Wow, I was happy to know that. Hopefully next year they will grow into bigger convention! Anyway, I want to post lots of pictures here to show you. I didn’t take a lot of pictures because we were busy meeting new people and working. 😛 Me and my friend cosplay during convention. It was fun! I enjoyed a lot and hopefully we can go to conventions to sell things together. These are gift from the vendor next to us. I was told that they were very excited because they saw my store name. I found out that they’re my Facebook followers!!! OH MY! Such as small world isn’t it? 🙂 I LOVE these cute pins, they even gave me an alpacasso one! I was wearing it during the whole convention, I LOVE IT 🙂 Thank you thank you! Here is my Junko Enoshima cosplay! She’s ordering a custom made Usagi & Hitsuji (Karneval) from me!!! OMG! 😀 I’m working on it atm and will post WIP in here shortly. Little snack for hardworking ladies <3 <3 Mr.Baird’s Gaijin Taiyaki was DELICIOUS! I don’t like chocolate BUT this chocolate toffeetaste great! I think I can eat that again and again 😛 LOL! This is my favorite picture, kissing my tissue box alpacasso ^^ She’s available for adoption, man, this alpacasso wants to work for you ^___^ Who wants to adopt her, hehehe. According to my customer, her three beautiful nieces likes Pikachu, blue puppy and bear. So I decorated bears according to their preference. Did you like the pikachu that I made? I really really like it! I’m thinking maybe I should make one for myself 😛 BTW, pikachu is my all time favorite Pokemon! This is the third bear that I made for them. Only with crystals and pearl beads. No needle felt was made because this is for the youngest girl in the family and she didn’t mention any favorite character or animal. BUT I gave her one big red apple, I hope she loves it! Really love to make custom orders! I guess this suits my personality. I don’t like to make same thing over and over again =_= To me, that’s boring. More items will be created and revealed in here, hopefully you guys will like what I created ^_^ By any chance if you’re attending the Animate Miami 2014 please come to our booth (#710) and say “HI” to us!